Back to School Sandwich: NYC Prep Style. 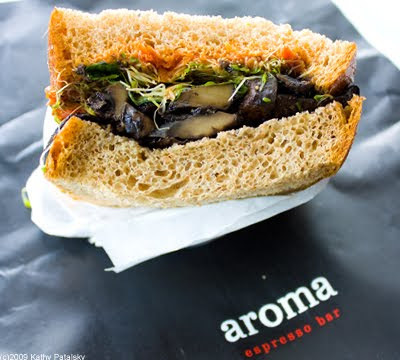 Aroma's Health: "Grilled portobello mushrooms, basil, alfalfa sprouts and a thick sun-dried tomato spread on our fresh baked Aroma bread." *Use a store bought spread or make your own using 3 Tbsp chunky marinara sauce with 1 Tbsp chopped sun dried tomatoes mixed in. 1. Clean and slice the mushrooms. Slice into thick finger-sized slices. 2. Saute mushrooms in a skillet with oil, vinegar, pepper and salt. 3. Turn off heat, but leave shrooms in hot pan, add your slice of cheese on top of the mushrooms-let it naturally melt. 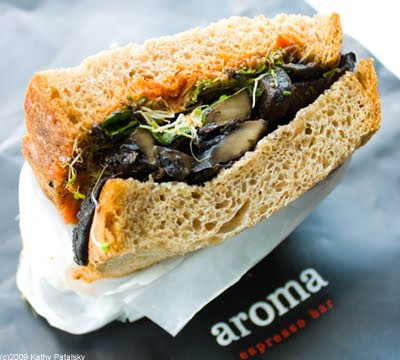 The cheese will cool off the shrooms which is good for your sandwich texture. Set aside pan until mushrooms are needed. 4. Spread your sun dried tomato spread (homemade or store bought spread) on both slices of bread. 5. Place a layer of chopped basil on top of the sun dried tomato spread. 6. Layer your portobello mushrooms and cheese on top of the basil. 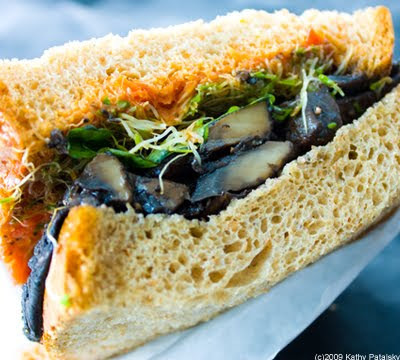 The mushrooms should be a nice hearty-thick layer. 7. Add a layer of sweet onions and a dash of red pepper flakes (both optional). 8. Add a layer of arugula or sprouts. 9. Place top slice of bread on sandwich and slice in half.